Arrow fans already know to set aside their Wednesday nights at 8 pm when the show is in season, but they might want to make some appointment viewing at the same time on a Monday night this week. 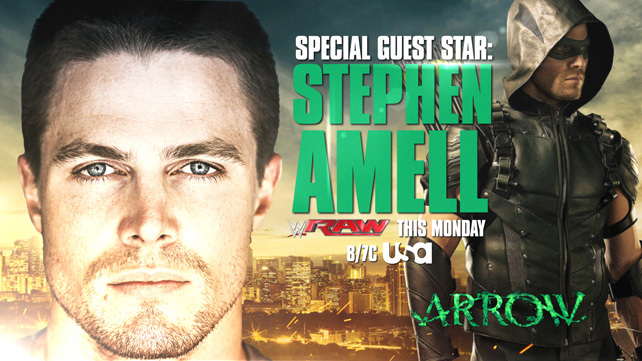 That’s because the WWE is heavily promoting the fact that TV’s Oliver Queen, Stephen Amell, will be a guest on tonight’s episode of Monday Night Raw from Seattle. His appearance is the biggest escalation yet of an ongoing war of words — one waged primarily on Twitter to this point — between the actor and a wrestler who knows something about costumed alter egos: Cody Rhodes, currently better known as Stardust. Though at one point it looked like we might see Amell in the ring at the WWE’s second biggest pay-per-view event of the year, SummerSlam, it now seems more likely that he’ll just be there to “give the rub” to Stardust and leave the in-ring work to a proxy. The way the feud has been written so far, all signs point to Neville, who has some comic book stylings of his own as the “Man Gravity Forgot,” actually locking up with Stardust on August 23 at the Barclays Center in Brooklyn. Then again, the card hasn’t been officially announced yet outside of the main selling point, a rematch between Brock Lesnar and the Undertaker, so you can always hope, and the WWE (and pro wrestling as a whole, for that matter), does have a long history of using celebs like Amell in the ring in special circumstances. Even if we don’t get to see him get physical, at least the WWE is getting into the proper Arrow Season 4 spirit, advertising him as playing Green Arrow in the series. We’ll be sure to give you the lowdown on any smackdown Amell is involved with later tonight. Raw airs at 8 pm on USA.